The Locker Room: New York Knicks: Why signing J.R Smith will create more problems than it will solve. 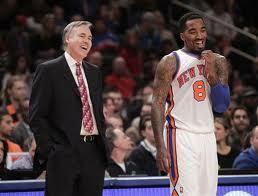 New York Knicks: Why signing J.R Smith will create more problems than it will solve. The New York Knicks look to have one of the more complete rosters in the NBA, what with their acquisition of shooting guard J.R Smith this week. He is renowned for his athleticism, shooting and ability to manifest the terms 'instant offense'. Although in recent years his maturity and his capacity to be coached have been questioned, leading to benching and suspensions. For these reasons, many teams passed on signing Smith upon his return from China. The Knicks organisation, players and fans seem to think they have struck gold in relation to his acquisition, and while they are right to be excited adding a player of his calibre, they will soon learn that it was not the right move to solving their puzzle to reach Eastern Conference dominance. PG: Lin, Davis, Douglas, Bibby. SG: Fields, Smith, Shumpert, Walker. Eight guards is too many for a team that endeavours to reach the Eastern Conference Finals. Looking at the rest of the roster, Carmelo Anthony is the only true small forward (no, Steve Novak does not count) and Tyson Chandler is the only true centre in the rotation. Sure enough, Fields, Walker and/or Smith can rotate to play the 3 when Anthony is on the bench. It is more so the fact that D'Antoni must somehow give starting or close to starting minutes to five guards. Smith is used to the sixth man role, averaging 24.9mpg last season with Denver, and will most definitely be used as such. The fact remains that Lin, Douglas, Fields, Shumpert and Walker are all averaging more than 20 minutes each game. Once Davis and Smith are incorporated to the rotation, multiple players will suffer to make room for the newcomers. New York already had too many point-guards as it was and was struggling to fit everyone in. With Smith joining the team, it changes the whole dynamic and identity of the backcourt; something New York had only just become accustomed to. As celebrated as his scoring and offensive skills are, Smith's attitude is equally notorious. His maturity has been called into question a number of times, which is evident in his play. More often that not, Smith will attempt low percentage shots or take unnecessarily difficult ones. In 2010 he was celebrated for his 360 alley-oop dunk against the Minnesota Timberwolves (http://www.youtube.com/watch?v=nHuqfQK6d28). While it was a spectacular feat, it was completely unwarranted and could have resulted in a turnover. When your team has a double-digit lead, on the road, it is shameless sportsmanship to show-boat. A similar situation arose in late December of 2006, when a fight erupted at Madison Square Garden (http://www.youtube.com/watch?v=iHP0gLGB5-g). The Denver Nuggets led the New York Knicks by 19 points with less than 2 minutes left. Smith brought the ball up on a fast-break, and while attempting a shot, received a hard foul by Mardy Collins; a foul later deemed to be a flagrant-2. The two began shoving each other as players, such as Nate Robinson, Carmelo Anthony and Jared Jefferies, attempted to restrain their team-mates. As seen in the video, Robinson attempts to swing at Smith as he is being confined by David Lee. He then breaks free, attacks Robinson and both tumble into the group of courtside photographers. The incident arises further as Smith won't back down and continues to attack Robinson, while Carmelo Anthony punches Collins and is then chased down the court by Jefferies. All five players were ejected and suspended for the incident, with Smith receiving a 10 game suspension. This episode cannot be attributed solely to J.R, but it certainly escalated much further than it should have by him tackling Robinson into the crowd. The last thing the NBA needed was a 'Malice at the Palace' 2.0 version. Smith's handling of the situation showed his inability to keep calm; an attribute most commonly seen in the top NBA players today, who by no small chance, are the most mature. He could easily be an All-Star level player with his offensive skills, but his failure to control himself, whether it be his temper or his shot selection, has limited his potential. The brawl was back in 2006 yet he has shown no signs of improving his attitude since then. 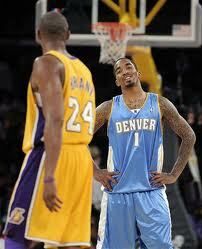 In 2010, Smith was publicized by calling out Kobe Bryant through his Twitter account by posting: "Dont get me wrong kobe is great but not when he play me". Through his Twitter account. Challenging your opponent is a medium of creating competitive basketball, but it is less than impressive when it is done on a social networking website. Teenagers insult each other back-and-forth through the same engine, and to challenge one of the top athletes in the NBA the same way makes one question Smith's wisdom. According to this Yahoo Sports' article, Smith proved to be increasingly difficult while playing in China during the lockout as well. From faking an injury, to refusing to receive treatment, to disobeying team protocol, it's clear J.R Smith is still a long way from maturing. 3. His role with New York. Offense is far-and-away where J.R Smith is most effective. He is a deadly 3-point shooter, has the ball-handling skills to create shots for himself and others and is supremely athletic at his position. The only issue preventing him from developing into an All-Star is his basketball IQ. On the court, he doesn't take the best, high-percentage shots and has been labelled a 'ball-hog' for this. What he must come to understand is that now he is a member of the New York Knicks, the team does not need all of that. 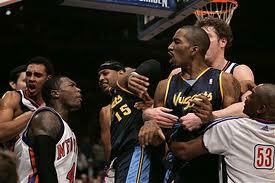 In Denver the offense was seemingly kept afloat by Carmelo Anthony, Smith, Nene and Chauncey Billups. His new team has a diverse range of offensively skilled players, ranging from Jeremy Lin, Toney Douglas, Landry Fields, Steve Novak, Bill Walker, Amar'e Stoudemire, Carmelo Anthony and even Tyson Chandler in certain situations. Any of these players is capable of putting up 15 points any given night, despite their inabilities to create opportunities; specifically Novak, Walker and Chandler. 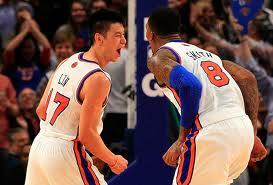 With the sudden rise of Jeremy Lin as the team's point-guard, Smith must adjust his game to suit how the team is run. In his very first game with the team last night, Smith shot 6 for 16, 3 for 9 from the three-point line. If both the Knicks stars were still on the bench for various reasons, this sort of offensive showing would be acceptable. 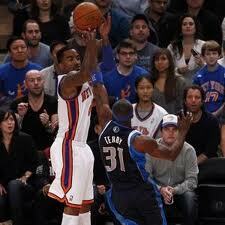 Yet it wasn't; Amar'e Stoudemire shot just 4 for 10 and 3 for 4 from the free-throw line. STAT is renowned for his capacity to run as the pick-and-roll man, most evident from his time with Steve Nash in Phoenix. Lin, who shot 11 for 20, is capable of running Mike D'Antoni's offensive system and could easily get Stoudemire the ball as Nash did. One might point out that even though Stoudemire didn't shoot as much, the team still won because of Lin's 28 points, 14 assists and 5 steals, and they would be right. The fact remains that Lin is trying to do too much for the team, evidenced by his 7 turnovers. Over the last 5 games, his assist-to-turnover ratio is a dismal 1.41 which would rank him alongside Kobe Bryant, Carmelo Anthony and Kevin Garnett. None of these players average more than 5 assists a game and if Lin is expected to produce the way he has from here-on-out, he needs to be much more effective. Before we get too side-tracked, both Lin and Smith need to understand that they are not the first or second options of this team. Carmelo Anthony and Amar'e Stoudemire are both stars in this league and therefore are expected to lead the New York Knicks. Smith cannot take the long, off-balance jump-shots he is accustomed to and needs to defer to his team-mates. If he can adjust to somewhat of a jump-shooter off the bench, the Knicks can be successful. Yet as of right now the Knicks cannot handle Anthony, Stoudemire, Lin and Smith all trying to shoot plus-15 shots a night. 4. 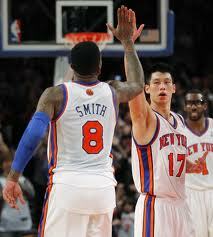 What Smith can do to improve the Knicks. 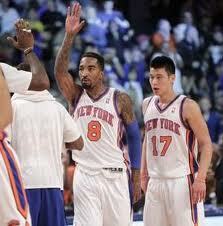 On a different note, J.R Smith can definitely improve this New York team. They rank 26th in 3-point field goal percentage in the NBA at this point in time, which is surprising considering the mass of shooters they have. This statistic can be attributed to their lack of a distributor for the majority of the season, proving difficult for the Knicks to create opportunities. With the addition of Smith, the emergence of Jeremy Lin and the soon-to-be return of Carmelo Anthony New York will surely rise through the ranks and be one of the better 3-point shooting teams in the league. Smith shot a decent 0.390% last season with the Denver Nuggets as their sixth man off the bench. If he can provide the same skills in a confined role rather than taking the majority of the perimeter shots, he will be exactly what New York needs. It is then up to the management of the Knicks to find suitors to their overstock of guards on the roster. 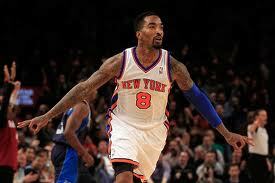 Signing an offensive talent like J.R Smith would improve the dynamic and power of any team's backcourt. For the Knicks, they now have one of the better rosters in the league, with Lin, Smith and Anthony on the perimeter and Stoudemire and Chandler down low. They also have Landry Fields and Jared Jefferies, who are both hard-working, hustling players who will do the dirty work for this team. Yet outside of this group, the rest of the roster will be hard-pressed to receive quality minutes of a consistent basis. Iman Shumpert, Toney Douglas, Baron Davis and Bill Walker can not all have regular playing time in the rotation. All four have received such as close as last season and even this season as well. If New York expects to make a deep push in the Eastern Conference, they cannot expect to with this roster. If you can name another centre on the Knicks roster off the top of your head, congratulations. The only other bigman they have coming in behind Chandler is Jerome Jordan: he averages 4.9 minutes in the few 12 games he has played. Management needs to orchestrate some roster moves as soon as possible, or obtaining J.R Smith will not work out as they had hoped.